AdStoK is certainly very bullish but also very overbought! Lines may not cross again, so one has to wait for a down gradient first. RUT has hit XOP (~832)yesterday so could calm down a bit today. Note that MM levels have now changed to align to daily ones, i.e. strong MM resistance level at 875. Note that AutoFib has detected a possible pattern with a first target at 852, i.e. close to July highs. 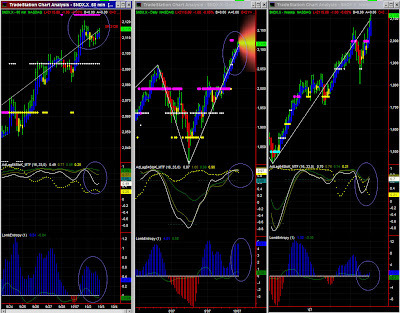 AdStoK is very bullish with a white line following cycles when NDX pauses for a moment. NDX will now hit 2125 and we have to now wait to see what comes next. 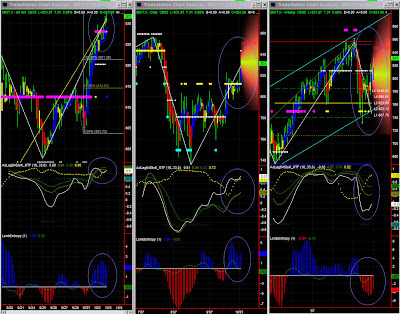 NDX is in an overall very bullish trend, indicating studying higher time frames (significance level is lower). AdStoK is bullish but Entropy shows possible signs of peaking and the MM range is actually narrower, indicating a possible trading range around this new 154.50 level. 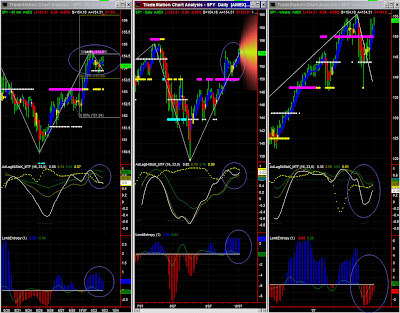 The Swing indicator is momentarily down, so SPY could pause or retrace a bit. Entropy is now stable at a high level, and AdStoK is giving a last bout to reach very overbought level without lines crossing. One can only expect continuation of the same situation, i.e. slow steady increase, at least until AdStoK lines cross. Entropy at 3 is historically very high, so a slowdown (rate of increase) is almost certain.